For a Linux embedded training, I need to find something fun to plug on an AVR32 board. The board used for the training is a NGW100 board. I decided to try to use the I2C bus. I have several I2C stuff on the desk, but nothing really fun and I don’t want to solder a lot of stuff, and spend a lot of time on this. I decided to use a Arduino board as a I2C slave device and plug this to the NGW100 board. To test the Arduino I used a Bus Pirate, this is quite simple and fun, here a little snipset of my initial test with the BP (note the string are different). The I2C slave is at the 0×4 address (check the setup()). On Linux, load the I2C-GPIO kernel module. On OpenWRT (used on the NGW100), simply load the kmod-i2c-gpio package. Final step: If everything is Ok, we can now test the communication. I used a small piece of C code to deal with I2C on Linux. Of course, I used string values but in real life a small protocol shoud be used. Another important thing: I used a NGW100 but you can use the same idea on all Linux embedded board like the Fonera, or anything else. Update: Of course you can use the i2c-tools on Linux to detect your own device. 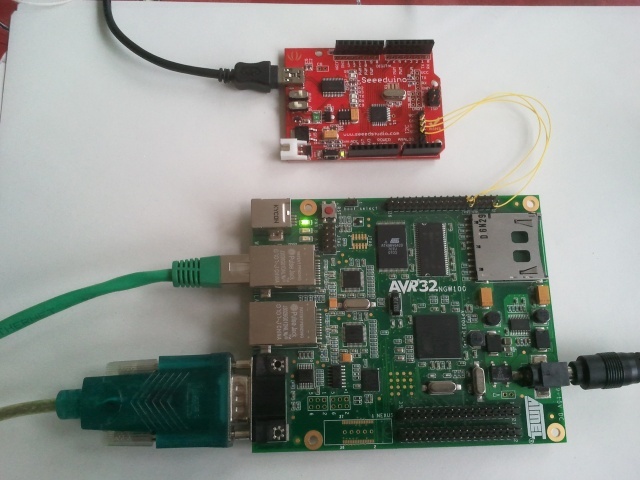 To do that : Grab the i2c-tools source, and cross compile it for the AVR32. (You only have to change the CC path in the Makefile). This entry was posted in Electronics and tagged arduino, I2C, linux, openwrt by admin. Bookmark the permalink.